Suddenly, it’s February. Valentine’s Day is almost here. So I felt like I need to talk about…LOVE! 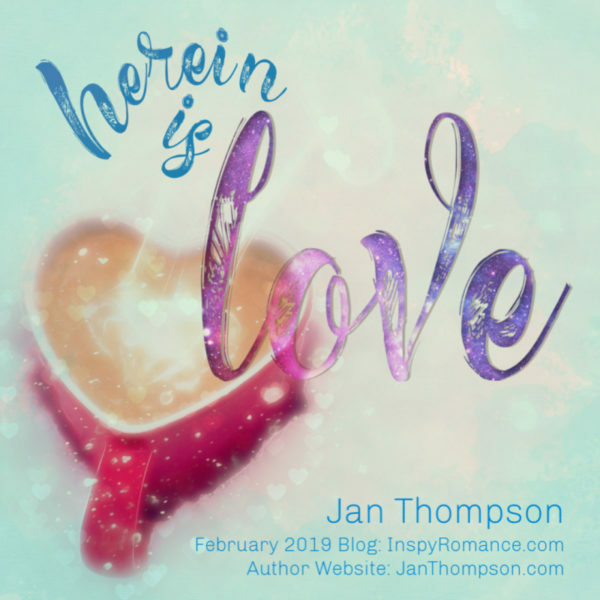 As an author of Christian Romance (and Christian Romantic Suspense, but that’s outside the scope of this blog), I keep in mind that, at the end of the day, I am writing about two people falling in love with each other in the light of God’s pure and holy love. That is what I write about. “He that loveth not knoweth not God; for God is love” (I John 4:8). Ultimately, speaking for myself, I cannot talk about true love without first acknowledging that God first loved us. As I revise Book 8 and draft Book 10 in my Savannah Sweethearts series, I am reminded once again that without Jesus Christ, I can never truly experience God’s love. In fact, my entire series is about Christians seeking after God’s perfect will for their lives, and honestly, they will see God’s will more clearly if they experience God’s love in their hearts first. Dear friend, do you know the love of God? Do you know of family members or loved ones who don’t know the love of God? If not, they can be sure today. Jesus Christ Himself showed us God’s love when He went to the cross to die for our sins, was buried, and rose again to give us eternal life. Because I believe in Jesus as my personal Lord and Savior, I am saved forever, and in my heart, I know God’s love is with me. Let me know in the comments below what Jesus Christ means to you and how you have experienced God’s love this year. I mentioned the two books I’m writing right now, which should be out sometime this year (prayerfully sooner than later). But Book 7 is ready to be released worldwide on February 12, just in time for Valentine’s Day. I would like to give away 3 copies of this ebook to 3 people who comment. The giveaway ends on February 13, 2019. 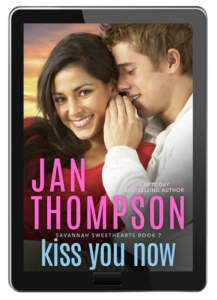 Kiss You Now (Savannah Sweethearts Book 7) is the story of Priyanka Patel and Hunter Jacobs, two people at the crossroads of their careers, brought together by the circumstances of their lives to Savannah and Tybee Island, where they have to learn to seek God and rest in Him, in order to be able to love each other. Read more about Kiss You Now. Preview 10% of Kiss You Now on Amazon (click on Look Inside). Don’t forget to comment about what Jesus Christ means to you and how God has shown His love to you. May God bless you with more of His love this year! Hi Jan, 1 John holds a special message doesn’t it? To quote song lyrics “Christ my all in all, the hope of my salvation..” that is Jesus to me. The source of peace, comfort and joy and love. He has shown His love through the gift of salvation, through my husband and sons and our extended family and friends. Through a secure job where I can share who He is to my students. Through the ups and downs I am thankful to be able to reflect and remember His leading in my life. Praise the Lord! Such a wonderful testimony, Wemble. Thank you for reminding us that “Christ is my all in all” indeed. I pray that future generations, and those even in our own generations who don’t know the Lord Jesus Christ, that they will someday see the “all in all” that we have found in Christ. That modern hymn by the Gettys is a good reminder too. Thank you for commenting! Have a wonderful day in the Lord! Hi Jan! Thanks for sharing your faith and how you express God’s love in your stories. I John 4 was the scripture my husband and I used at our marriage ceremony, since we had family and friends that weren’t believers. We have been married 45 years. Through the thick and thin of life I am reminded in Hebrews 13:8 (KJV) “Jesus Christ the same yesterday, and today, and forever.” God’s love does NOT change on a wym. He loves us unconditionally and is patient and kind (ICorinthians 13). Best wishes on your upcoming books. Happy Valentine’s Day. Wow, that’s delightful to find out that you read I John at your wedding. That’s a great idea to share verses in a setting where there might be people who need to hear about God’s love! Glad you mentioned I Corinthians 13. That entire passage was read at our wedding. Incidentally, it was also read at my father-in-law’s funeral decades later. Truly, God’s love is the same, whether we live or die. Indeed, Jesus never changes! Praise the Lord for the reminder from Hebrews 13:8. Thank you again for commenting, and Happy Valentine’s Day! I adore your books, Jan! I love how you always keep God front and center in all of your writing! Thank you very much, Paula Marie! God is teaching me a lot of stuff as life goes on, and sometimes some of what I learn permeates into my books! Ultimately, to God be the glory! Thanks again and have a wonderful weekend in the Lord! God’s love means everything to me. As I heard at a recent conference…according to Ephesians1,” God loved me in Christ before He lost me in Adam.” I find it hard to feel loved or to give love but this assurance helps me each day. Praise the Lord that you are able to share God’s love with your parents. Being a caregiver can be taxing in so many ways. I remember spending a few weeks taking care of my mother when she first had that massive stroke that left her partially paralyzed. I was drained! But God was and is still my sustainer. He is always good! God is my all in all. He sees me thru the good times and the bad. Thru the loss of a son, a baby granddaughter my husband and parents. The wonderful hymns we sing in church are so encouraging. When I am sad to Him I go, Leaning on the Everlasting Arms, Jesus loves me. These are the thoughts that come to me and give me the strength to face each day with a smile. JESUS IS ALL THE WORLD TO ME. Love your wonderful and inspiring books. Yes, indeed, “Jesus is all the world to me” too. God is good all the time. I am so sorry to hear of your losses, but God is faithful through and through. I love those old hymns too, and I wish more churches still sing out of hymnals. I have bought a couple of those hymnals at home just to preserve them since they are disappearing fast from church pews. It’s like people don’t read music anymore or something. All those words in the hymns are such rich reminders of God’s mercy and grace. Thank you again for stopping by. Appreciate your comments. Virginia. Thank you for reading my books. To God be the glory! Thank you for sharing such an awesome testimony, what a blessing. I love the Lord with everything in me. He fills me with joy and peace every day despite what is going on around me and in these trying times. Thank you, Linda! Oh I totally agree that God fills us with peace and joy, none that the world or anything can take away. Who can separate us from the love of Christ! The joy of the Lord is our strength indeed! Thank you for your comments and may the Lord bless your weekend! I love the Lord and know he loves me everyday! Several things have happened to me in my life and I know each and every time God has been there for me and I could not have made it through with him! Praise the Lord! I also remember so many times when God protected my family and me, and kept us safe, e.g. in a thunderstorm some years ago, it looked like a tree was swaying toward the house and was going to fall on it with us inside, God caused it to fall the other way in the forest instead, so my son and I were safe. God is our Deliverer! Thank you for praising the Lord! Christ is my all in all. Amen! Thank you for praising the Lord! So many amazing testimonies of the goodness and grace of God. Thank you, ladies for commenting! Indeed, God is good. God is love! We will be doing the fun random drawing later this week (I am told that we give a week of time, in case some others are seeing this blog post late). And then IR will randomly draw 3 names for me to gift you the Kiss You Now ebook, and we’ll let you know! I wish I could give an ebook to everyone who commented since everyone has great praises. But maybe next time! Jan, thank you so much for talking about God’s Love! So precious <3 and thank you for writing about it! I’m praying He blesses you abundantly and gives you lots of inspiration! I feel His love every day – when I wake up every morning, when I see smiles of my kiddos, when I praise Him in church! Thank you for your prayers, Natalya! May God bless you in amazing ways this year as well! And what a beautiful day today to be at church! Have a wonderful week in the Lord! Thank you, everyone, who has commented! We have 3 winners and I have contacted them.